Two styles of pointed pen calligraphy that have been enjoying a resurgence in popularity are Copperplate and Spencerian scripts. Unfortunately, these two beautiful styles are a point of confusion for some calligraphers who are at a loss to distinguish between them. In this article I will try to demystify the Copperplate-Spencerian enigma. We must start by first clarifying the terminology. Copperplate is a term that is widely applied to several types of shaded script. 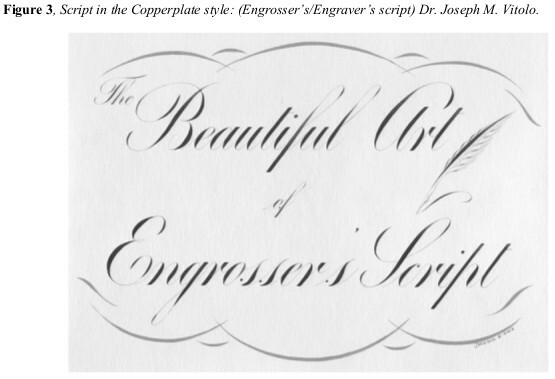 Copperplate styles of script include roundhand, Engraver's and Engrosser’s scripts. Roundhand or more specifically English roundhand script (Figure 1) is a form of quill pen based handwriting that flourished in England several centuries ago (1, 2). Some of the finest exemplars of this work are the engraved forms so wonderfully represented in The Universal Penman by George Bickham (2). The hand- penned script of the English writing masters (1570-1800) was frequently engraved onto copper plates for printing (1, 2). This fact would eventually give rise to the term Copperplate when referring to roundhand script. 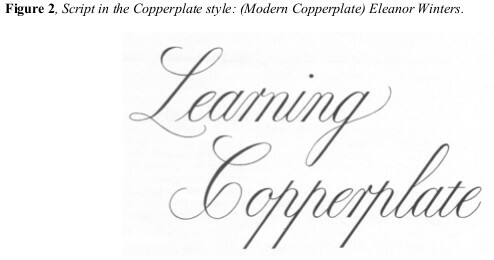 Modern ‘Copperplate’ instructional manuals consist of letterforms (Figure 2) that are based on English roundhand script using techniques adapted for the pointed flexible steel pen rather than a quill pen (3). 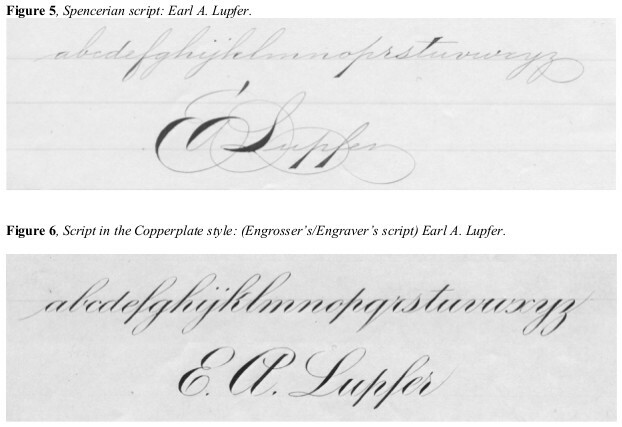 The two additional forms mentioned above as Copperplate styles are Engrosser's and Engraver's scripts (Figure 3). According to The Zanerian Manual these terms are essentially interchangeable (4). This particular form of script developed in the U.S. as an attempt to simulate the wonderful roundhand script of master metal engravers. Hence the term Engraver’s script was used. Since the style also became popular for engrossing documents such as college diplomas the term Engrosser’s script was also used. 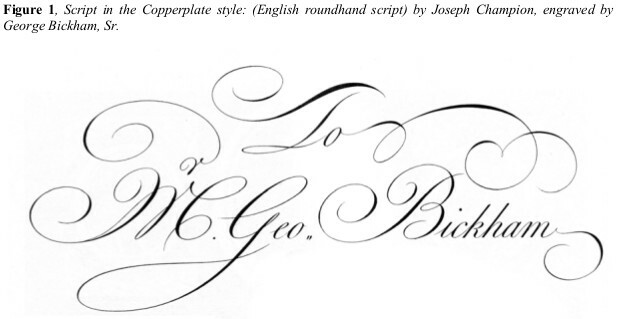 It is very important to note that while all three styles are grouped under the category of ‘Copperplate’, only English roundhand script was a form of handwriting. Whereas Engrosser’s (Engraver’s) script is more accurately described as the drawing of letters using slower deliberate strokes with more pen lifts. To avoid confusion I will only use the term Copperplate to describe these styles. Next, I would like to discuss a uniquely American form of handwriting called Spencerian script (Figure 4). Originally developed by Platt R. Spencer, Sr. and based in part on the graceful forms he observed in nature such as the smooth oval pebbles in a stream (5, 6). It is likely that Spencer originated his script using a quill pen; however, the evolution of Spencerian script was influenced by the availability of high quality steel pens such as the Gillott 303 and the Spencerian No.1. Interestingly, prior to Spencer, handwriting in colonial America was essentially a less ornate form of English roundhand (Copperplate) (7-9). Spencer's letterforms reached their zenith during the golden age of American Ornamental Penmanship. This period lasted from approximately the latter half of the 19th century through the early portion of the 20th century (6, 10). Additional terms that would fall under the ‘Spencerian’ umbrella are Artistic writing and Ornamental script (6, 11). For the purposes of this discussion I will use the term Spencerian script. So how does one distinguish between these two styles, Copperplate and Spencerian? I am not going to detail letterform variances, connectors angles, slant angles, etc. but will instead cut right to the chase. When trying to distinguish between these styles of script focus on the lower case letters (Figures 5 and 6). In general terms Spencerian hands (Figure 4, 5) utilize delicately shaded lower case letters. In fact, the shading may be completely absent from some lower case letters such as the ‘i’. Also, the use of 'wedge shaped shades for letters for the vertical ascender of 't' and 'd' as well as the descender stem of 'p' is common. However, there are variants that do not employ this style. On the other hand, Copperplate lowercase letters (Figure 6) utilize regularly shaded lower case letters. Rather than the delicate lower case forms seen in Spencerian script, dramatic contrasts between shades and hairlines are created in the lower case letters. The end result is a hand that while quite beautiful, it does not resemble modern cursive script handwriting as developed in the United States. In Figure 7, three versions of the name Zanerian are presented. 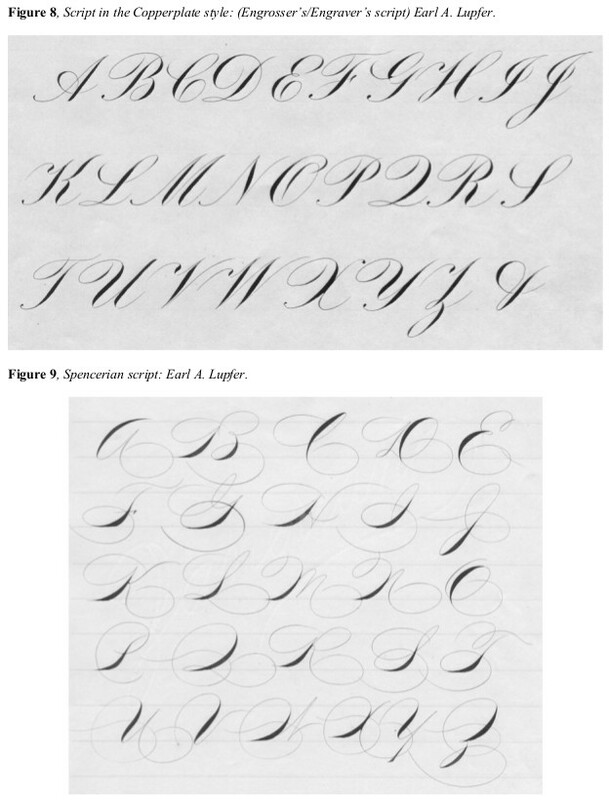 The top version is the Spencerian form. Notice how delicately the lowercase letters are shaded. In fact, the ‘e’ and the ‘i’ of Zanerian are not shaded. Hopefully, your eye will note that these letters look very similar to the monoline style of school handwriting (Zaner-Bloser Method) pictured in the middle image (12). Stated in simplest terms, Spencerian type lower case forms resemble the beautiful cursive script handwriting taught in U.S. schools such as the Palmer and Zaner-Bloser methods (12, 13). 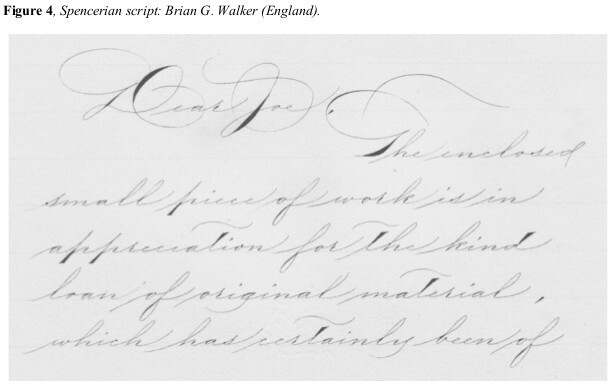 Interestingly, both of these handwriting methods were influenced by the Spencerian forms. In contrast, the dramatically shaded Copperplate style of script shown in the bottom image of Figure 7 is markedly different than the top and middle images. Most notably, all of the lowercase letters are shaded. This gives script in the Copperplate style a more formal appearance. 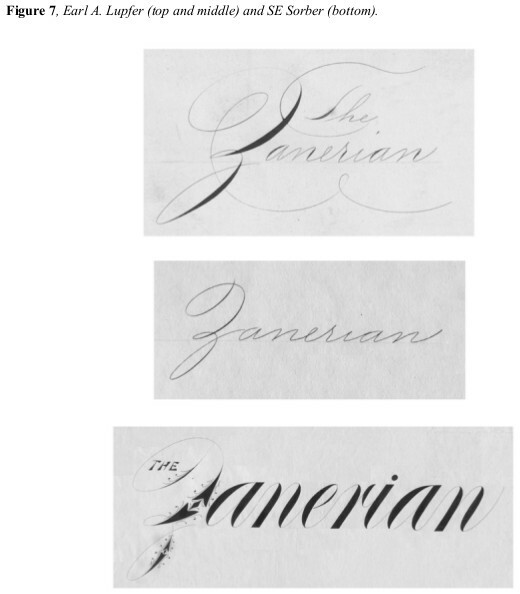 The extensive use of shading moves the Copperplate styles of script further from the style of handwriting shown in the middle image of Figure 7. Distinguishing between Copperplate and Spencerian uppercase letter forms requires an extensive knowledge of the letters and their variants and is beyond the scope of this article. However, I have provided uppercase exemplars of Copperplate and Spencerian capitals for you to examine in Figures 8 and 9, respectively. It should be noted that it is common to find Spencerian capital letters used in conjunction with Copperplate style lowercase letters. Therefore, this fact coupled with extensive letterform variance makes it impossible, at times, to absolutely classify a given specimen. It is my hope that after reading this article you will have an easier time distinguishing between the two styles of script. Remember not to get distracted by the ornate swirls, curls and embellishments that frequently accompany both of these forms. Instead look to the lowercase letters to decipher the script’s identity.